This must be the week for nice Alfa Romeo Alfettas to appear on eBay. As I mentioned in the earlier post about an Alfetta sedan, the first Alfa Romeo I bought was an Alfetta. I bought a few more Alfettas after that one and found them all to be really fun cars to drive. The Sprint Veloce (or Alfetta GT or GTV - Alfa never seemed to be able to settle on a name for this model... I had a 1975, called a GTV and a 1979, called a Sprint Veloce, and with the exception of some VERY minor trim pieces, they were the same car) has always had an image problem among Alfisti. Alfa Romeo stopped importing the car to the US in 1979. They then brought it back in 1981 with a V6 engine and called it the GTV6. The bigger, more powerful V6 engined car pushed the 4 cylinder Sprint Veloce into the background and it never gained the respect it deserved. In my opinion the Alfetta line is the last "purely Italian" line of cars Alfa Romeo brought to the US. Very few concessions were made for the US market (any concessions that were made were, for the most part, federally mandated). For instance, when you sit in the drivers seat and the only gage you have in front of you is the tach. The rest of the instruments are located in a cluster in the center of the dash. (This was criticized by the automotive press when the car was introduced, but look at how many new cars now have a center instrument cluster. It could be argued that Alfa was ahead of the times) In a great Italian car all you really need to see is the tach, right? The later GTV6 had all it's instruments located in front of the driver. The design of the Alfetta still looks great today. The only thing I would change on this car is the bumpers. It has the US mandated 5MPH bumpers which do nothing for the look of the car. I'd take them off and replace them with European bumpers. Everything I wrote in the earlier post about the Alfetta sedan holds true for the Sprint Veloce. 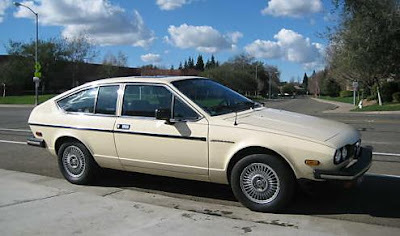 If I wake up tomorrow morning and find out that during the night my driveway and bank account balance had magically increased by 5 times their current sizes, one of the first things I'll do is find a nice Alfa Romeo Alfetta. The Alfetta is one of the last fun to drive, pure Italian automobiles that can still be had for a reasonable amount of money. Click here to see the eBay listing for this Sprint Veloce.